Columbia-MBF™ is a part of Atkore International®, the premier supplier of electrical raceway systems for the electrical industry. Columbia-MBF™ offers Aluminum Rigid Conduit (ARC), Elbows, and Couplings that meet all of your electrical raceway needs. Columbia-MBF™ Aluminum Rigid Conduit (ARC), Elbows, and Couplings deliver the vital protection for your cables and conductors. Columbia-MBF™ ARC offers “Peace of Mind” in harsh or clean environments such as waste-water treatment, food processing, oil refineries, paper mills, and power plants. Columbia-MBF™ Aluminum Rigid Conduit (ARC) is produced from high purity 6063 aluminum alloy, T-1 temper. Columbia-MBF™ aluminum conduit, elbows and couplings combine light weight and corrosion resistance to support a complete-line of easy to install, low maintenance conduit raceway whenever specifications call for aluminum. Columbia-MBF™ Aluminum Rigid Conduit (ARC), Elbows, and Couplings are considered to be non-combustible and maintain physical properties after prolonged outdoor exposure. When searching for a raceway solution that allows for future wiring changes and affords excellent mechanical protection to conductors and cables, experience Columbia-MBF™ Aluminum Rigid Conduit (ARC), Elbows, and Couplings. 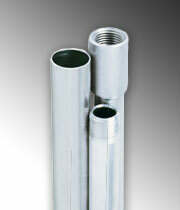 Columbia-MBF™ Aluminum Rigid Conduit (ARC) provides EMI shielding and is 100% recyclable. Committed to serving the needs of the electrical industry and in our mission to provide exceptional service and value-added to customers, Columbia-MBF™ Aluminum Rigid Conduit (ARC), Elbows, and Couplings are stocked at distribution centers across the country. Our Aluminum Rigid Conduit (ARC), Elbows, and Couplings are part of the Atkore Electrical Raceway portfolio of products and can be co-loaded with many of our other Columbia-MBF™ and Atkore Electrical Raceway products. To learn more about the benefits of using Columbia-MBF™ brand Aluminum Rigid Conduit (ARC), Elbows, and Couplings and to see a complete list of our Aluminum Rigid Conduit (ARC) raceway products, please browse our offerings and experience the benefits of Columbia-MBF™ raceway products. Columbia-MBF aluminum elbows are manufactured of 6063 alloy in temper designation T-1.